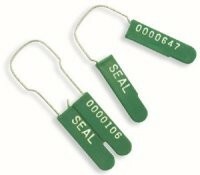 The Split-Lok Plastic Security Seals are a wire and plastic security seal that can be used in a variety of applications. The Split-Lok Plastic Security Seals are scored so they can be opened by hand after the security seal has been securely applied. Body with thin central membrane splits if attacked or tampered with. Wire scored at center for ease of removal; wire ends retained in plastic body on removal.